Paragliding. That’s the main reason to come here, other than the panoramic views, the crisp air 1500 metres above sea level, the bursts of colourful flowers, the romantic sunrises and sunsets, or the near spiritual tranquillity of Brazil’s only official mountain range. The mountain forms a natural ramp from which gliders can take off, and you’ll usually find the air full of extreme sports enthusiasts. Weather conditions permitting, you can see as far away as the mountain peak of Itacolomi in the city of Ouro Petro. 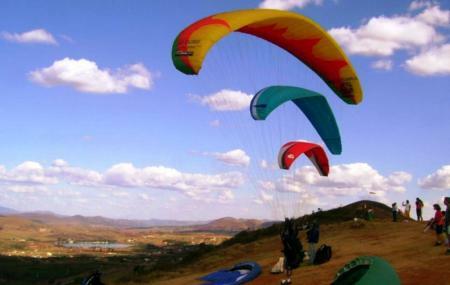 The best way to go paragliding here would be as part of a guided tour. Tour groups may be found in the city. Check out the Topo do Mondo (Top of the World) restaurant. You’ll have to drive to here.Follow the BR-040 towards Rio de Janeiro, for about 31.2 km south from Praça da Liberdade in Belo Horizonte. How popular is Serra Da Moeda? People normally club together Museu De Arte Da Pampulha and Cachoeira Santo Antonio while planning their visit to Serra Da Moeda. Um lugar lindo e único. Belas vistas, uma rota diferente..